We decided to celebrate the end of Breaking Bad with an episode of Champagne Meets Sushi. We decided to go with a decent bottle from our most recent trip to Wine Library and had a great evening. Recently we’ve cleared out space for 4-5 bottles in our fridge to have some pre-chilled white options at all times. I’d really recommend doing this even if you don’t drink white regularly…it’s much easier than trying to speed chill in the freezer or a bucket. colonelgrape: 85. This is a classic blend but the color is more of a blanc de noir, more of a dark gold/amber. Nice carbonation and pleasing to the eye, nose full of apples, citrus and vanilla. Brisk, zesty, and full bodied on the palate. Crisp, refreshing, and elegant finish. Very well structured wine with fruit, earth and body from nose to finish. To me the only flaw was the slighly overpowering apple flavor, I would have liked a little more balance with the fruits. MobyGrape: 86. Applesauce colored, a little apple tasting, I don’t know why I tend to get that from some champagnes but I do. It wasn’t offensively bubbly, paired well with sushi (shocker), and it certainly made facing the end of Breaking Bad a little easier. Much like the ending itself, it didn’t totally blow me away, and it wasn’t exactly what I wanted, but at the end of the day I was ok with it. 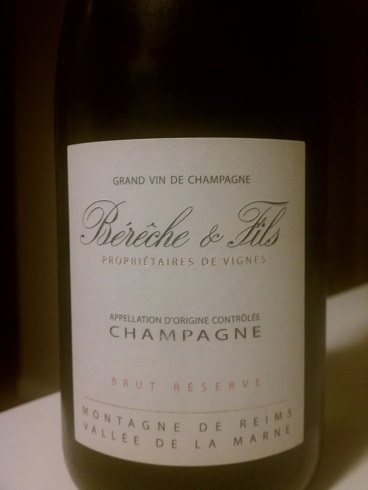 This entry was posted in Champagne, Chardonnay, France, Pinot Meunier, Pinot Noir on October 26, 2013 by colonelgrape.